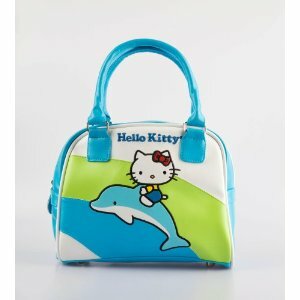 Hello Kitty has never designed anything ordinary, but you do have to wonder what psychotropic chemical the designers were on when they envisaged Hello Kitty riding a dolphin! Silly jokes aside, this cheap and cheerful mini bowler will no doubt be much appreciated by all the children out there. You know that phase many girls go through where they want to copy their moms? Well this is the sort of fun purse that will function in that role, although I can't really imagine many self-respecting adults owning it! OK, so there isn't much more to say about this 1978 bowler bag; it is kitsch, cute, and at $19.99 it isn't pricey either. The Helen Rochfort Scratch and Sniff handbag, a great alternative to this cute bag.